Here is our short list of suggestions for putting together a Stockholm itinerary if you can only spend one day in Stockholm. We got to spend one day in Stockholm on an epic 19 day cruise! In our short visit we discovered Stockholm to be a captivating city filled with history, beautiful architecture and unique attractions that we are longing to return to. We have included first hand tips for planning your visit, hand picked restaurant recommendations as well as a special section at the bottom of the post for those coming in on a cruise ship from the Stockholm cruise terminal or from the Nynashamm cruise ship port. Here are our hand picked recommendations from our experience spending 1 day in Stockholm along with some ideas from our Stockholm itinerary wish list (with more detail included below). This list will give you a number of exciting options for putting together the perfect Stockholm 1 day itinerary! 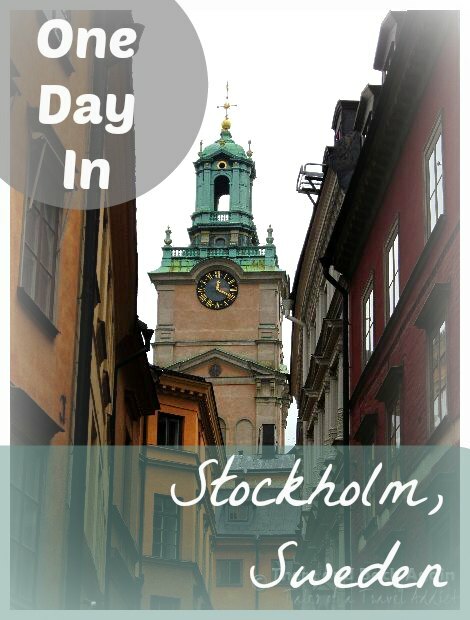 If you are planning for more than one day in Stockholm (and you really should…there is SOOOO much to see!) and you are looking Stockholm hotels, here is a link to a great resource with some great options! 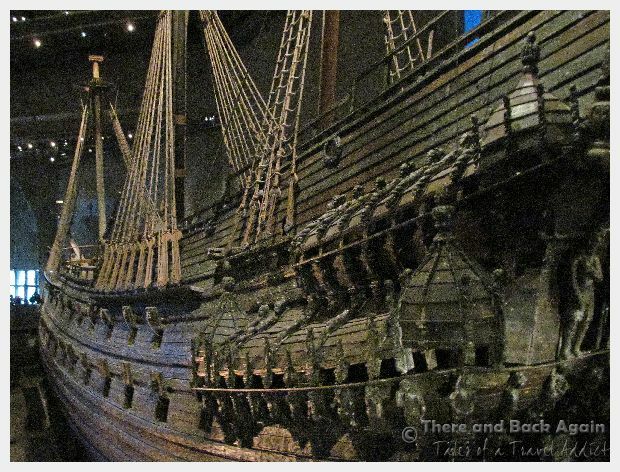 The Vasamuseet Stockholm is a must see if you are spending 1 day in Stockholm. The Swedish warship Vasa was supposed to be the flagship of the Swedish naval fleet. It sank on its first voyage out of Stockholm harbor in 1628 and there it sat, preserved by the cold, brackish waters until it was salvaged in 1961. The restoration work that has been done on the ship is absolutely remarkable. The size of the ship is overwhelming, and the intricate details and figures carved on the outside of the ship convey a level of craftsmanship and care that I cannot even imagine in today’s assembly line, industrialized systems of production. The admission price includes a guided English tour. If a guided tour is not your thing, they also have an MP3 guide available for download on their website. Get here as early as possible. I think that we arrived by 9:00am or so, and there was no line at the time. By the time we exited at 10:00am, the line was considerable as this is the top tourist attraction in the city. It should definitely be at the top of your list of what to do in Stockholm! How to get to the Vasamuseet Stockholm: Take the #7 tram towards Waldemarsudde. Otherwise, bus 67 (stop Nordiska museet/Vasamuseet) or bus 69/76 (stop Djurgårdsbron). If taking the metro, take the red line to Karlaplan and it is a 10 minute walk. 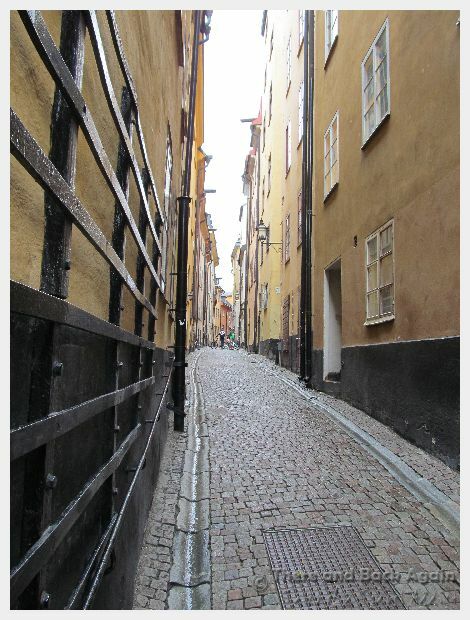 “Gamla Stan” means “Old Town” in Swedish. This part of Stockholm is filled with colorful 17th and 18th century buildings and it definitely is worth spending some time in. Wander and get lost in its charming cobbled streets. Stop for a coffee and pastry at one of the many cafes. Had we had more than just one day in Stockholm, I would have loved to have gone into the Nobel Museum, which is located in Gamla Stan. Alas, I guess that just means that we will be making another trip to Stockholm someday! How to Get to Gamla Stan: Easiest to access via Tunnelbana (metro). Take any red or green train to the Gamla Stan stop. You can also walk to the Gamla Stan from the Centrale or Slussen metro stations. The Gamla Stan can also be accessed via a number of bus lines. The Royal Palace in Stockholm is worthy of a visit if you enjoy endless ornately decorated rooms and learning a little bit about Stockholm history and tradition. You can also enjoy the pomp and ceremony of the Stockholm Royal Palace Changing of the Guard. This takes place daily in front of the palace during the summer at 12:15p (1:15 on Sundays) and lasts for approximately 40 minutes. The hours vary for the Stockholm Royal Palace Changing of the Guard during other seasons – check this webpage for details. How to Get To The Royal Palace Stockholm: Take the Tunnelbana (Metro) to the Gamla Stan stop (5 minute walk) or the T-Kungsträdgården stop (10 minute walk). Alternatively, take a bus to Slottsbacken or Riddarhustorget (5 minute walk). Fjallgatan is a popular vantage point that will give one of the best views in Stockholm. Around the corner from the viewing platform are a collection of wooden buildings that will show you what life used to be like for Stockholm’s poor. Monteliusvagen is an equally spectacular viewpoint. 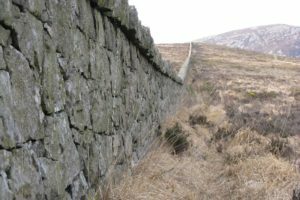 This one is accessed via a narrow footpath. Because it is not as easy to get to, it also tends to be less touristy. Either one will give you photo worthy views of Stockholm. Monteliusvagen: Take the Tunnelbana (metro) to either the Slussen or Gamla Stan stops and it is a 13 minute walk from there. Fjallgatan: Fjallgatan is a 13 minute walk from the Slussen Tunelbana (Metro) stop. If the big city isn’t your thing, you might enjoy a trip out to the Stockholm Archipelego. Think of the Stockholm Archipelgo as Stockholm’s playground. Beaches and recreational opportunities abound. The islands are dotted with picturesque villages giving visitors a glimpse of a more traditional lifestyle. Visiting the Archipelago can be a day trip from Stockholm or the basis for a longer exploration of 3 days in Stockholm or 4 days in Stockholm. How to Get to the Stockholm Archipelago: Transportation options will vary depending on which island you are heading to. Some islands can be reached directly by boat from Stockholm City Center. Others can be reached by taking a bus or train and then connecting to a boat. This website has more information about getting to the Stockholm Archipelago. We travel with kids, so I can’t mention a daytrip to Stockholm without talking about Djurgården. This is one of the best places to visit in Stockholm with kids. Junibacken is a fairy tale story world that will feed your kids’ imagination. Gröna Lund is a nearby amusement park and this is all in close proximity to the Skansen Open Air Museum and the Vasamuseet (mentioned below). How to Get to Djurgården: Tram #7 (towards Waldemarsudde, multiple stops), or busses 67, 69 or 76 (multiple stops). The Skansen Open Air Museum is a great place to learn about Swedish history in a very immersive, hands on sort of way! This is a perfect addition to your Stockholm itinerary, especially if you are traveling to Stockholm with kids. The museum has lots of room to roam and explore and a playground and zip line when they get antsy! A trip to Ostermalms Salulhall in Stockholm is a great way to sample traditional Swedish fare. Ostermals Salulhall is a foodie paradise housed in an ornate building from 1888. It is a great place to sample a wide variety of traditional Swedish fare. Unfortunately, it didn’t work out for us, as we were in Stockholm on Sunday and it wasn’t open then. It is definitely on my list for what to do in Stockholm on our next visit! How to Get to Ostermalms Salulhall: Take the Tunnelbana (Metro) red line to the Östermalmstorg stop. Bus 54 also stops here (Östermalmstorg stop). 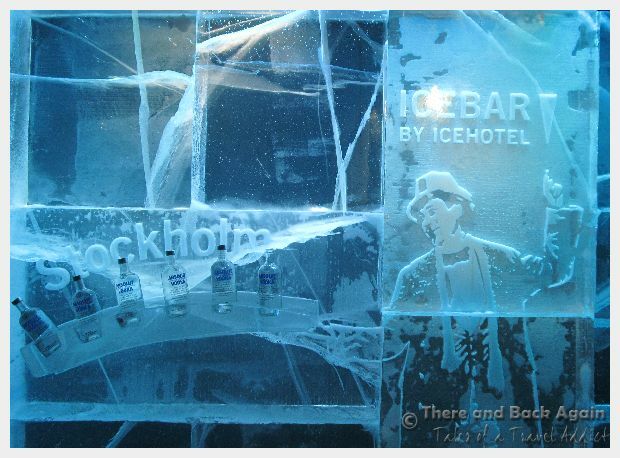 There are Ice Bars all over Northern Europe, and the whole cruise, we had been looking to go to one. The Ice Bar in Stockholm is one of those slightly overpriced experiences that you want to have once, but might not ever do again. It was great fun! We donned our provided winter capes and gloves, and were admitted into an icy wonderland of a bar where the chairs, and glasses, and even the bar itself was made of pure, blue ice. How to Get To the Ice Bar Stockholm: Take a tram, train or bus to the Stockholm Central Station. It is a 6 minute walk from here. Slingerbulten: Typical Swedish fare in good portions in an unpretentious, authentic environment. Look for the great value Swedish classics on the menu, as well as more adventurous offerings. Langbro Vardshus: This restaurant gets glowing recommendations on Tripadvisor. It looked a little “foo foo”, but the food looks creative and the portions seem generous. It looks like it has a lovely patio for outside dining in nice weather. Pocket by Pontus Frithiof: A intensively budget friendly, people friendly sort of place to go for a lunch or weeknight family dinner. Nothing over 185 kronor, inexpensive kids meals. Sound like a winner to me! Stockholms Gastabud: This is a small but popular family run restaurant (ie – you might have trouble getting a table, but that is just the sign of a true hidden gem). Traditional Swedish home cooking in a slightly rustic environment that just looks real and welcoming. 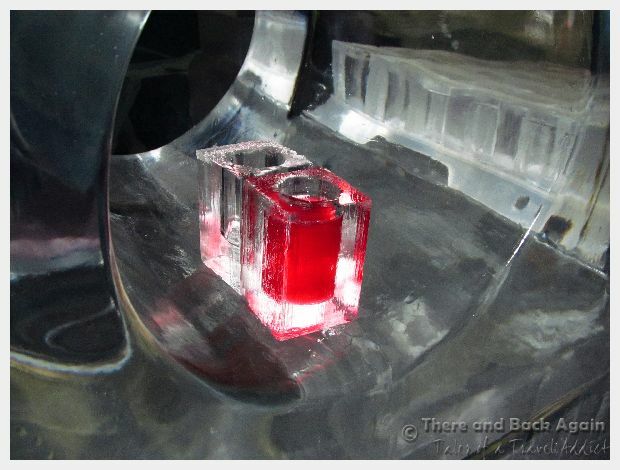 Looking at the pictures makes my “off the beaten path gem alarm” ring full force! A Stockholm Pass gives you admission popular Stockholm attractions and CAN help you skip the line in some places saving you precious time! A Hop On, Hop Off bus tour can be an easy way to connect a number of attractions in a convenient way. Put the attractions and restaurants that you are interested in on a map. Grouping attractions by location will keep you from running willy nilly all over the city and help you make efficient use of time. Don’t try to see too much! Pick one or two attractions that are most important to you to focus on in one day. This will leave you time to enjoy and stop to appreciate what you are seeing, instead of doing nothing but running around checking things off of your list. Get to the BIG attractions early in the day or very late. Things like the Vasa Museum get crowded mid morning and don’t generally clear our until late in the day. You don’t want to spend your precious time waiting in line. Stockholm has a robust and easy to use public transportation system that makes getting around a breeze! The system consists of a network of trains, trams, buses and boats. This website has an excellent guide to using public transportation in Stockholm. This is a link to the official Stockholm Public transportation website. If you just need a trip or two, you can buy individual fares. For more extensive travel, travel cards are available for 24 or 72 hours. These are good for all public trains, trams, buses and boats (there is a supplement for the airport train). You can also purchase a Stockholm Pass which is valid for entry into many popular Stockholm attractions. If you are seeing a few different sights in Stockholm, this pass could save you a TON of money! Children under the age of 7 travel for free. The water buses are often a convenient way to get between the big tourist sights in Stockholm and will give you lovely views of the city from a different perspective! From what I understand, most cruise ships dock right in Stockholm. If you are one of the few cruise ships that dock in the Stockholm cruise terminal in Nynashamm, Sweden (as we did on our Baltic cruise on the Holland America Eurodam) these tips are especially for you. If you are coming docking at the Stockholm cruise ship port in Nynashamm, Sweden (as opposed to docking directly in Stockholm), you will need to take a tender boat ashore as there is no pier here. The tender ride for us took about 10 minutes. To get from to and from Stockholm to Nynashamm and back is a little more complicated than it is for those who dock directly in Stockholm. From the tender dock, follow the blue line painted on the sidewalk to the train station to head into Stockholm. The walk will take about 15-25 minutes. There might be taxis waiting at the tender dock, but according to the information that we received, the taxi drivers aren’t happy about such a short fare and will insist that they drive you all the way into Stockholm, instead. The train ride into Stockholm took about an hour. If you are coming into the Cruise port Stockholm and you take into account the time that it will take to tender, walk to the train station and ride the train in and back out at the end of the day, you may have limited time available for sight seeing in Stockholm. The train fare one way into Stockholm is approximately 72 SEK (approximately $12 as of 2012). For 115 SEK (approximately $19 as of 2012) you can buy a day pass that includes your train ride into Stockholm and back as well as buses, metro and water ferries. Stockholm is a city of water, and the water ferries are one of the most efficient ways to get around to the major attractions. What are your best tips for spending one day in Stockholm ? I really REALLY wish the cruise I was on went up north. So much so that I’m debating selling another couple months of my life to a cruise company so they’ll pay for all my visas. Alas, the furthest north we got was Spain. woo. I can completely relate to only having one day to enjoy an entire country- or even port city, but looks like you guys made the most of it!! Pingback: 19 Days on the Holland America Eurodam!